Innovation requires breaking boundaries and making connections between diverse disciplines. As a creative profession, industrial design deals with the design of innovative, sustainable and durable solutions for people, nonhumans, economy and society, which may take many forms from tangible artifacts to expansive system designs. The Master of Industrial Design (MID) program at Iowa State University specifically emphasizes strategy and innovation with a strong focus on empathetic human-centered design research. It centers on the creation and application of new knowledge through in-depth investigations culminating in a written thesis. At the same time, students expand their design practice skills using innovative methodologies, collaboratively throughout the entire design process. 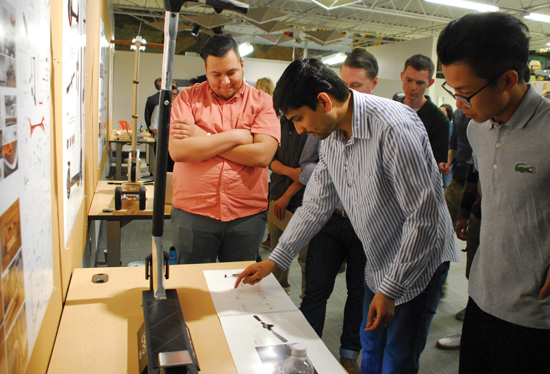 Students explore, generate, transfer and implement multidisciplinary information and technologies into foundational knowledge for the discipline of industrial design. The MID is a 63-credit program of study, distributed across three consecutive years. Applicants are required to have design and/or engineering degrees from accredited institutions or relevant industry experience. The goal of the industrial design graduate program is to create an agile program that addresses current and emerging issues in design strategy, innovation and human-centered design. Its position, in one of the most comprehensive design colleges in the country, facilitates the integration of methodologies and skillsets from multiple disciplines. Additionally, ties to the nationally ranked ISU College of Engineering, the ISU College of Business and industry collaborators create some truly unique degree specializations. Students are able to explore advanced concepts in such areas as extended manufacturer responsibility, supply chain and logistics, international vendor relations, advanced materials and biopolymers, and alternative business models. These courses are taken over two semesters. After finishing the Intensive Track, students must pass a cumulative review with program faculty to proceed into the MID. These courses can be used in place of MID Studio requirements [INDD 503 or 504] or taken over the Summer. Students may have room in their schedule to explore a concentration outside of the MID. This is an optional track that can significantly compliment INDD coursework. Undergraduate degree in design or engineering fields or three-year related experience in design practice. Minimum undergraduate GPA: 3.0/4.0 for full admission. Below 3.0/4.0 may be considered for restricted admission but must maintain 3.0 if accepted and until degree confirmation. Compliance with General Graduate College requirements not outlined above. Research Proposal: The proposal should specify the research area on which you wish to focus with details on the objectives and deliverables to be accomplished. (See Research Areas section that follows.) This proposal should also include the names of the faculty member(s) with whom you would like to work, describing the reasons you are interested in that (those) faculty member(s)’s research portfolio. This proposal could be submitted as a 2-minute video, a 2-page written document or a 2-page visual documentation. Visual Portfolio: A minimum of 5-page PDF file demonstrating the visual skills of the applicant including examples of process work and problem solving. References: Names, email addresses and phone numbers of three references with their titles and affiliations. Copies of your most recent transcripts. Skype or Phone Interview: As needed. Compliance with Graduate College requirements. Jan. 15 submission, March 1 response. Late submissions may be considered, although priority is given to timely submission. The definitions of the research areas are listed below with sub-categories. Exploring the synthesis of needs, technologies and business models and investigating methodologies to support design innovation to create sustainable competitive advantage. Innovation in Practice: Investigating the endeavors of designers to extend the knowledge base of design as part of their professional responsibility with the goal of exploring and generalizing knowledge based on design activities and products. Innovation Methodology: Studying the current design methodologies embedded in the design process and generating innovative methodologies that will speed up the process and facilitate effective communications across disciplines. How can we minimize the amount of time spent in the transition from concept generation to manufacturing? How can manufacturing constraints be transferred to the early stages of the design process? How can we help design students become effective collaborators throughout the design process? How can we support design practitioners in searching, sharing, evaluating and choosing appropriate approaches for successful innovation? Social Innovation: Studying new strategies, processes and solutions that meet the social needs and create social value, and educating the society for community development and health. Exploring strategic decision making and organizational aspects of the design process regarding the direction to choose and how to manage relationships with partners within a business. It integrates expertise from design, management, organizational processes and psychology of design-making into a systems approach. Through the lens of Design as Strategy, we see design taking a leadership role. We understand design as being holistic, incorporating all possible influences, employing all modes of processing and having its own culture of thinking and doing. In the words of Nelson and Stolterman, having its own culture of inquiry and action. We are taking a systemic approach to disseminating design outside our own domain, putting the tools and methods front and center from research to implementation. Entrepreneurship: Designers are the new drivers of entrepreneurialism. This research area focuses on the growing demands of the global culture and creative industries and the skills vital in today’s modern entrepreneurial and knowledge-based economy. Design Management: Examining companies’ design capabilities and brand strategies, and how their strategies are reflected in/on their products. How do industrial designers interact effectively with other disciplines and how do they practice management skills regarding managing people, projects, schedules and budgets among other responsibilities? Data VIZ: The role of data visualization is of the utmost importance in the design process. Through visualization or what we call visual sensemaking, we discover connections and identify patterns, communicate thoughts and ideas, synthesize problems, uncover facts and create possibilities. Visual sensemaking can break down barriers through low-fidelity visualizations, allowing for an all-inclusive problem identifying and solution creating environment in cross- and interdisciplinary teams. The success of every innovative design solution lies in a human-centered approach to design and development. Human-centered design is a creative problem-solving approach for designing products and services that are centered on human needs. The research concentration will focus on practicing diverse ethnographic and social science methodologies for translating human needs into meaningful products and services. Innovation through human-centered design is the key for developing innovative solutions that are valuable to users, obtain competitive advantage and are environmentally and socially responsible. Culture-Centered Design: In this era of increasing globalization, products and services initially designed to serve only the local market are now reaching across international boundaries. Designers in this global age are agents of cultural change and should be cognizant of the impact their products have on local cultures. How can we design products that are culturally appropriate? How do global changes impact local cultural preferences? Culture-centered design provides a framework designers and researchers to integrate cultural aspects, both micro and macro, into the design and development process.